It's your wedding day. You've got the legal bit out the way, and it's time to get the party started. Your guests are waiting, but what song will you and your new spouse walk in to? Just like any big Hollywood blockbuster, these momentous occasions in life should come with their own soundtrack. Luckily, this is one time when you get to pick which song will start off your married life. This is the perfect opportunity to pull off something unique that really reflects your personality, so make it funny, romantic or quirky. 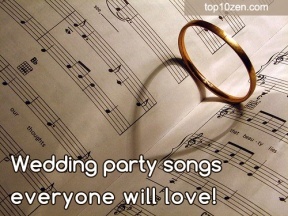 For those of you who are in the middle of planning the backing track to your big day, I've put together ten of the best wedding party entrance songs ever. If you're stuck for inspiration, pick one of these to get your wedding off to a lively start! Forever is the top 10 charting 2007 hit for R'n'B singer Chris Brown. There's no better way to start your married life and slip into your wedding party than with some silky smooth vocals and easy listening music. Chris Brown isn't the sort of person that you'd naturally gravitate towards when it comes to relationship advice, but he's hit the nail on the head with this song. The title says it all; the lyrics 'It's like I've waited my whole life for this one night' are the perfect words for you to enter the biggest party and the best night of your life! You can always rely on a boyband to come up with a cheesy (oops - did I say that out loud? I meant romantic...) song to play at a wedding. Your wedding day is the greatest day of your life, so Take That have turned the whole experience into a song, in the form of Greatest Day. In all seriousness, if you like a bit of clean pop music, then this is a fabulous choice. Entering your wedding party with this song playing in the background will create a magical, loving atmosphere which is exactly what you need!